This winter has been the rainiest and warmest on record since 1895 across the U.S. Corn Belt, with unusually high soil temperatures accompanied by record-breaking rainfall. Because of these abnormally warm, wet conditions, you’re probably wondering what potential impact these weather events have on the amount of available nitrogen in your fields. Field data collected from two of our Climate Research Farms in Illinois indicated a high risk of available nitrogen loss after heavy rainfall events in November and December 2015. As we head into the 2016 growing season, this is a great time for you to plan ahead and take a fresh look at your nitrogen program to achieve the greatest return on investment at the end of the year. A small, but notable contribution from climate change, which has brought warmer temperatures1,2,3 and more intense rainfall1,2,3 to the Midwest. An El Niño4 event in the tropical Pacific, which is partially responsible for a strong Pacific jet stream shifting north of its normal wintertime position over the U.S., allowing warm, moist air to move north from the Gulf of Mexico more frequently. Random year-to-year variations in the atmospheric circulation, which affect storm systems’ frequency, intensity and paths, leading to enhanced precipitation. In addition to being farther north than normal, the enhanced jet stream caused by El Niño favored a wavy pattern with cooler air west of the Rocky Mountains and warmer air east of the Rocky Mountains, where average temperatures were 3 to 10°F above normal (See Figure 1). These warmer air temperatures led to warmer soil temperatures as well, impacting how nitrogen moves through the soil. As usual, a number of storms crossed the Midwest in early winter; however, coupled with mild temperatures and abundant moisture from the Gulf of Mexico, these storms dumped heavy rain rather than snow. The heaviest rain events occurred Nov.16-18, Nov. 27-28, Dec.13-14 and Dec. 27-29 in 2015. Two-month totals varied greatly throughout the Corn Belt, ranging from near normal in the Eastern Dakotas and Western Minnesota, to 5”-10” above normal in Iowa, Illinois and Missouri. 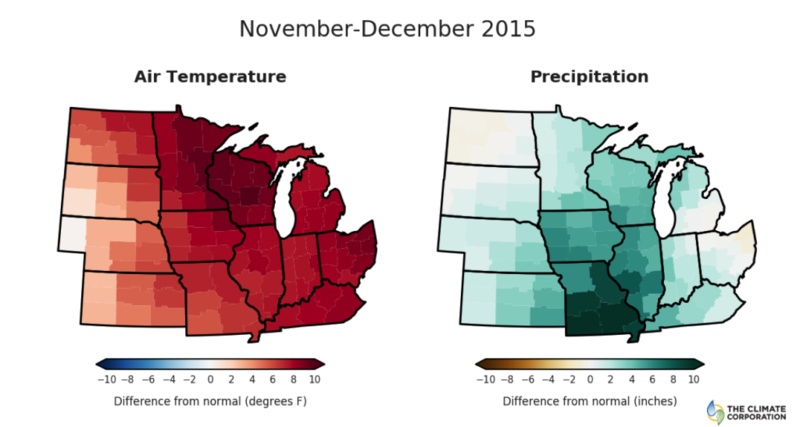 It was the wettest November-December period on record across much of the Corn Belt. These heavy rains had an effect on available nitrogen in the soil and raised many questions for farmers, such as: Will I have enough crop-available nitrogen when it’s time to plant my fields? Should I make adjustments to my nitrogen application plans? Extensive field data collected from two of our Climate Research Farms in Illinois indicated a high risk of available nitrogen loss after heavy rainfall events in November and December 2015. Because nitrate moves easily through the soil, the record-breaking rain storms in December 2015 moved a significant portion of the nitrate below 2 feet into the soil profile. Our research tells us that in addition to heavy rainfall, certain field-specific conditions can increase the risk of nitrogen loss. Specifically, fields where nitrification inhibitors, such as N-Serve™, were not applied or where application occurred relatively early in the fall (e.g., October instead of November), could suffer from greater leaching. Also, fields with coarser textured soils and higher saturated soil water conductivity values (Ksat) or finer textured soils with tiling, can experience relatively higher leaching. Figure 2. Climate Research Farm fields show various levels of nitrogen loss depending on soil type and texture. Anhydrous nitrogen was applied on the fields 101C and 115 on November 16, 2015. Nitrogen present was determined from the FieldvIew Pro N Advisor as well as Soil Nitrogen measurements on December 11 2015 and January 6 2015. Based on farmers who used FieldView Pro in 2015, more than 35 percent of the acres in our system showed a deficit on the lower end of the weather-dependent range in Nitrogen Advisor. 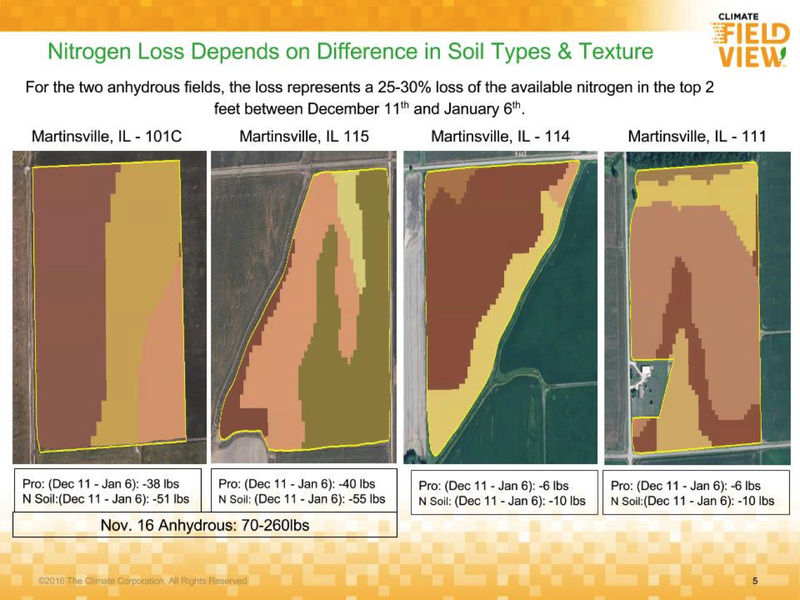 The Nitrogen Advisor model results were consistent with the soil sample data pulled from the Climate Research Farms, with the model projecting a 25-30 percent reduction in the amount of nitrogen still present in the top 2 ft of the soil. From Climate’s 2015 field trials, more than 80 percent of the time when Nitrogen Advisor projected an end-of-season shortfall during the side dress window, a side-dress application would have protected the crop from yield loss due to nitrogen deficiency. Although the Nitrogen Advisor is earmarking this nitrate as being lost from the top 2 ft of the soil, it’s still possible for the crop to use this nitrogen so long as high spring rains do not push the nitrogen deeper into the soil profile.. If you’re questioning how much nitrogen in your fields is still available for plant uptake for the 2016 growing season, Climate FieldViewTM Pro Nitrogen Advisor is a powerful tool to track and estimate nitrogen availability throughout the entire growing season. Midwest National Climate Assessment. Globalchange.gov. Web. 17 March 2016.